You can save a life when you take in an animal in need, whether as a temporary foster home or a permanent adoptive home. Read about our process for fostering or adopting a rescued animal. True Blue Animal Rescue is a 501(c)3 Non-profit, No-kill Animal Rescue in Central Texas, established in 2004. 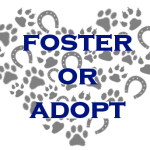 We are run by dedicated volunteers and our animals cared for in loving foster homes.